Όπως αναμενόταν, η Renault παρουσίασε επίσημα σήμερα τον turbo V6 κινητήρα, με τον οποίο θα πάρει μέρος στην turbo εποχή, κι έχει ονομασία Energy F1-2014. Θα έχει ιπποδύναμη κοντά στα 600 άλογα, με την κατανάλωση καυσίμου να είναι 35% λιγότερη (ορισμένη από τους κανονισμούς στα 100 κιλά καυσίμου ανά αγώνα), καθώς ο περιοριστής στροφών θα πέσεις στις 15.000 σ.α.λ., από τις 18.000 σ.α.λ. που είναι σήμερα, ενώ κάθε οδηγός θα έχει στη διάθεσή του μόλις 5 κινητήρες για όλη τη σεζόν, αντί για 8 που έχει σήμερα. Όσον αφορά το Σύστημα Ανάκτησης Ενέργειας (ERS), θα έχει απόδοση 161 ίππων (διπλάσια απ’ ό,τι σήμερα) και θα είναι 10 φορές πιο αποδοτικό από το τωρινό KERS, σύμφωνα πάντα με όσα ισχυρίζεται η γαλλική εταιρεία. Οι δοκιμές των νέων μονάδων θα γίνουν τον Ιανουάριο, με τις ομάδες να θέλουν, αρχικά, να εξασφαλίσουν ότι όλα λειτουργούν όπως θα ήθελαν, διότι η αξιοπιστία είναι το πιο σημαντικό στον μηχανοκίνητο αθλητισμό. Μετά, εννοείται πως θα δουλέψουν για να τους κάνουν ακόμα πιο αποδοτικούς, διότι η απάντηση από τη Ferrari και τη Mercedes αναμένεται ισχυρή. 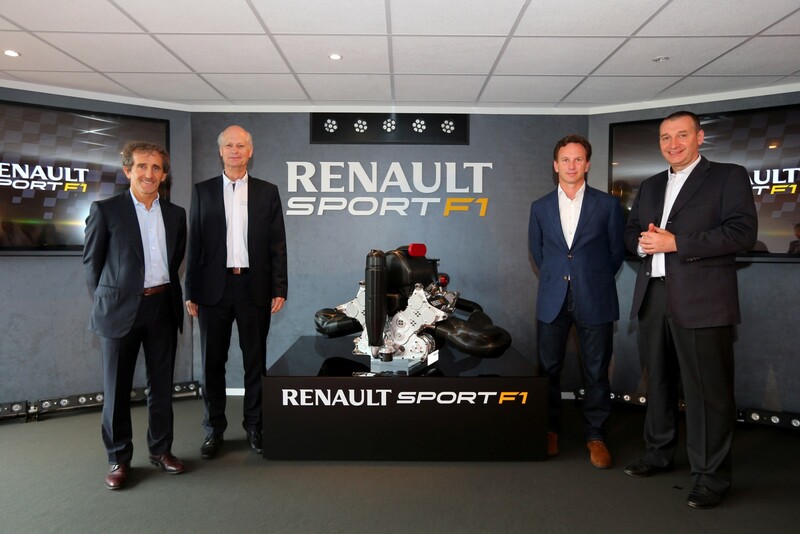 Paris Air Show at Le Bourget: Renault presents its innovative new power unit designed to the new technical regulations to be used in the FIA Formula One World Championship from 2014 onwards. The new generation Power Unit is officially named Energy F1-2014 reflecting synergies with the pioneering fuel efficient Energy engine range used in Renault road cars. The race-intent Power Unit revealed for the first time demonstrates a radical leap in Formula One powertrain technology, achieving groundbreaking fuel efficiency from its direct injection turbocharged engine allied to cutting edge energy recovery systems and electrification. In 2014, Formula 1 will enter a new era. After three years of planning and development, the most significant technical change to hit the sport in more than two decades is introduced. Engine regulations form the major part of the coming revolution, with the introduction of a new generation of Power Units that combine a 1.6-litre V6 turbocharged engine with energy recovery systems that will dramatically increase efficiency by harvesting energy dissipated as heat in the exhaust or brakes. The maximum power of the new Power Unit will exceed the output of current V8 F1 engines, however, fuel efficiency will be radically improved. With only 100kg permitted for the race, the new units will use 35% less fuel than their predecessors. For several years, Renault has used its racing know-how to develop fuel efficient engines for road cars, notably its Energy range. The objectives are clear: maintain or improve driving pleasure, vitality and acceleration with downsized engines to achieve lower fuel consumption and CO2 emissions. 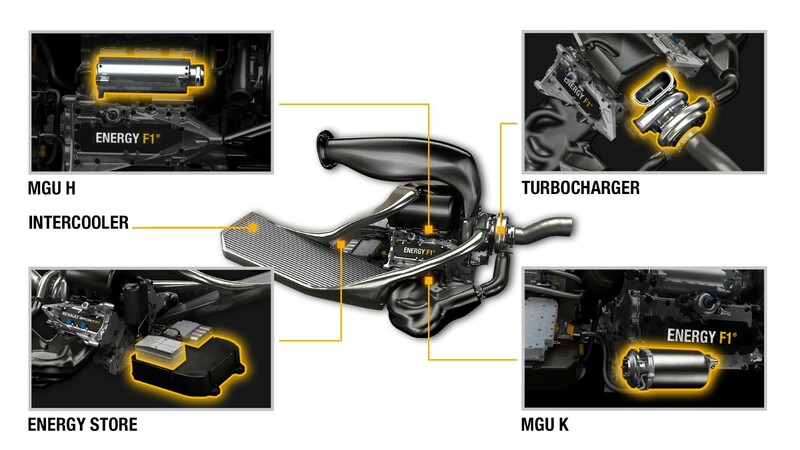 Renault has employed these principles in developing the F1 Power Unit, creating a complete, and genuine, circular development process between road and track. For these reasons, Renault has named the F1 Power Unit series ‘Energy F1’; clearly illustrating that the F1 Power Unit shares the same DNA as its road-going cousins. 2014: What are the rules? 1.6L direct injection Turbo V6. Unique pressure charging architecture: single turbine and compressor (plus E-motor allowed). 5 Power Units per driver per season in 2014, reducing to 4 in subsequent years. Fuel quantity for the race limited to 100 kg initially (-35% from now – currently unlimited). Fuel mass flow rate limited to 100 kg/hr max – currently unlimited. V6 is shorthand for an internal combustion engine with its cylinders arranged in two banks of 3 cylinders arranged in a ‘V’ configuration over a common crankshaft. The Energy F1-2014 V6 has a displacement of 1.6 litres and will make around 600 bhp, or more than 3 times the power of a Clio Renaultsport. A turbocharger uses an exhaust driven turbine to drive a compressor to increase the density of the intake air consumed by the engine and so make more power for a given displacement. The residual heat energy contained in the exhaust gases after expansion in the cylinders of the engine is converted to mechanical shaft power by the exhaust turbine. The mechanical power from the turbine is used to drive the compressor, and also the MGU-H (see below). As the turbocharger speed must vary to match the requirement of the engine, there may be a delay in torque response, often known as turbo-lag. One of the great challenges of the new Power Unit is to reduce this to near zero to match the instant torque delivery of the current V8 engines. A wastegate is often used in association with a turbocharger to control the system. It is a control device that allows excess exhaust gas to bypass the turbine, to match the power produced by the turbine to that needed by the compressor to supply the air required by the engine. With direct fuel injection (DI), fuel is sprayed directly into the combustion chamber rather than into the inlet tract upstream of the inlet valves. The fuel-air mixture is formed within the cylinder, so great precision is required in metering and directing the fuel from the injector nozzle. This is a key sub-system at the heart of the fuel efficiency and power delivery of the Power Unit. A motor generator unit (MGU) is an electrical machine. When operating as a motor, the MGU converts electrical energy to mechanical energy. When it operates as a generator the MGU converts mechanical energy to electrical. 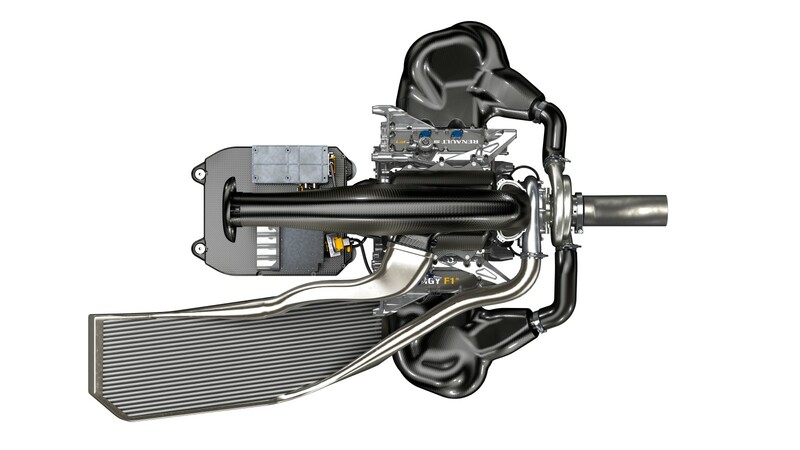 The 2014 Power Unit uses two MGUs; an MGU-H (H for Heat – exhaust energy recovery) and MGU-K (K for Kinetic – kinetic energy recovery during braking). The MGU-K is connected to the crankshaft of the internal combustion engine and is capable of recovering or providing power (limited to 120 kW or 160 bhp by the rules). Under braking, the MGU-K operates as a generator to slow the car (reducing the heat dissipated in the brakes) and so recovers some of the kinetic energy and converts it into electricity. Under acceleration, the MGU-K is powered (from the Energy Store and/or from the MGU-H) and acts as a motor to propel the car. The Power Unit’s ERS (Energy Recovery System) uses the MGU-H and MGU-K plus an Energy Store, plus some power and control electronics. Heat and Kinetic Energy recovered can be consumed immediately if required by the other MGU, or used to charge the Energy Store. The stored energy can be used to propel the car by the MGU-K or to accelerate the turbocharger by the MGU-H. Compared to 2013 KERS, the ERS of the 2014 Power Unit will have twice the power (120 kW vs 60 kW) and a performance effect 10 times greater. 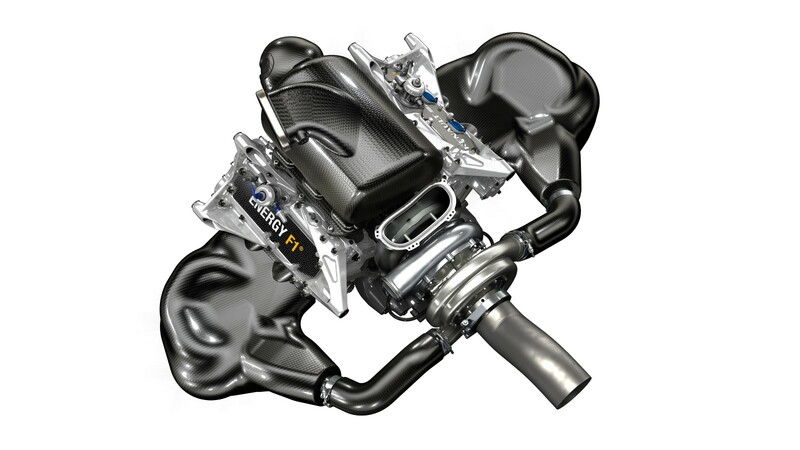 Renault today released the first official sound recording of the Energy F1-2014 Power Unit. A simulated lap of Singapore demonstrates that engine noise will remain an important ingredient of the F1 show with the new generation Power Units. ‘‘The sound of the engine is the sum of three principal components, exhaust, intake and mechanical noise. On fired engines, exhaust noise dominates, but the other two sources are not trivial and would be loud if the exhaust noise was suppressed and contribute to the perceived sound of the engines in the car. ‘‘All three sources are still present on the V6. At the outset, there is more energy in each combustion event but there are fewer cylinders turning at lower speed and both intake and exhaust noise are attenuated by the turbo. Overall, the sound pressure level (so the perceived volume) is lower and the nature of the sound reflects the new architecture. ‘‘The car will still accelerate and decelerate rapidly, with instant gearshifts. The engines remain high revving, ultra high output competition engines. Fundamentally the engine noise will still be loud. It will wake you from sleep, and circuit neighbours will still complain. The engine noise is just a turbocharged noise, rather than a normally aspirated noise: you can just hear the turbo when the driver lifts off the throttle and the engine speed drops. January 2012: After seven months of design and build, the first cylinder of the V6 is tested on the single-cylinder dyno in Viry. This extremely accurate dyno enables micro analysis of the combustion event and fuel consumption in one cylinder, facilitating iterative design enhancements that can ultimately be scaled up to all six cylinders without unnecessary time or economic loss. June 2012: After six months’ testing on the single cylinder dyno, the first full V6 prototype is tested on the full dyno. Initial tests focused on achieving reliability over short distances before increasing the number of kilometres completed. The first power curve – or the complete range of operating speeds – was achieved at the end of August. February 2013: The MGU-H and MGU-K energy recovery systems are assembled and tested on the dynos alongside the V6 internal combustion engine. The technical regulations demand radically advanced and complex design solutions so the design and manufacture stage lasted considerably longer than the design phase for the thermal engine. June 2013: First race-intent Power Unit and Energy Recovery System is run on the dyno for the first time. Two years of planning and preparation are reconciled, and the complete unit – more or less in its final stages – enters the final stage of optimisation before its eventual track test. Early January 2014: The Power Units will be installed into the partner teams ready for fire up and launch. Mid January 2014: The first 2014 chassis will hit the track. ‘‘Exchanges between chassis and engine teams started at a very early time, before the regulations were fully defined,’’ explains director of programmes and customer support, Axel Plasse. ‘‘We had very general discussions regarding the principles of the regulations and how we could achieve our combined aims, or indeed whether the aims were feasible. From Renault’s point of view it was essential that the new regulations should include very aggressive fuel consumption targets to reflect growing environmental concerns and also provide a test bed for innovative solutions. ‘‘The teams were however also concerned about the sporting show: F1 cars should still be the quickest competition cars in the world. The cars should also not be too easy to drive, that is, engines should not be flat out all the time – there should be a balance between wide open, partial and off throttle that rewards driver skill. Everyone however recognised the equal validity of the ‘green’ targets and the need to retain the element of the ‘show’. ‘‘How we could marry the two when they seem mutually exclusive was one of the early challenges. At this point the chassis and engine teams began to discuss power scheduling, or how sufficient power would be supplied from the engine with the limitations imposed by the regulations. ‘‘We came up with a number of ideas to meet the required expectations. The way the turbocharger and the wastegate are used, for example, how we control the combustion events and engine mixes and the behaviour of a direct injection engine versus a port injected engine. ‘‘Once we had determined the basic principles, we moved to the design phase of the project. This was mid 2011, and stretched into the beginning of 2012. We established design reviews with our teams, scheduled every other week. The meetings started with just a handful of people, but as time went on more and more people from different departments started attending, on both sides of the Channel. It underlines the fact that the Power Unit and the brand new rules are a complete new way of working and exceedingly complex; several different departments in the engine and chassis teams were implicated, from control systems to aero to cooling. In fact at times we had twice as many people on the 2014 Power Unit as we did for the V8 reviews! 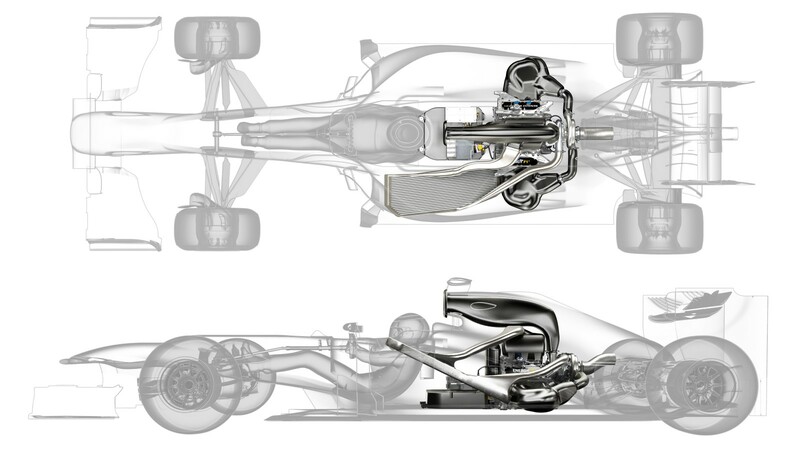 ‘‘The Power Unit is therefore much more integrated and central to design, for example the turbo overlaps the gearbox so it intrudes into the space where there was a clutch or a suspension part. The energy store is also much larger, which has an impact on chassis length, fuel volume and radiator position, amongst other items. ‘‘Since the first days of the turbo units in the 1970s, Renault’s philosophy has always been to facilitate chassis integration, so at a very early stage we had regular video chats, conference calls and site visits to our teams, particularly Red Bull Racing, our development partners, to decide the direction and key milestones so designs on chassis and engine could be synchronised. ‘‘A lot of topics ended up with question marks so Red Bull and Renault had to jointly decide the best course of action together. This is where the transparency with which we worked paid dividends. This is actually the benefit of being an engine supplier rather than a team owner: we can have access to a range of solutions and find a common path for each. ‘‘We also worked closely with our other teams, which is a risk but also an opportunity – everyone gets the benefit of the input as the greater the overall improvement to the Power Unit, the greater performance gains. If we differentiate between specs we have to design, validate and sign off multiple specifications of engines rather than consolidating the best ideas. ‘‘There are two sources of energy to propel the car; fuel in the tank and electrical energy in the energy store, or battery. The use of the two types of energy needs an intelligent management, since the permissible fuel consumption in the race is limited to 100kg and the battery needs recharging to avoid it going flat,’’ technical director for new generation Power Units, Naoki Tokunaga, explains. ‘‘For 2014, the fuel flow is limited to 100 kg/hr, and the fuel quantity for the race to 100kg. So if the car uses fuel at the maximum permitted rate of 100 kg/hr, it can do so for only 1 hour. The car performance is intended to be similar to 2013, so in fact the races will last more like 1hr 30min. Of course the circuit and car characteristics will not allow the cars to run at maximum power all around the lap. On all circuits, it is predicted that the natural fuel consumption for the race distance will be close to the allowed 100kg, in some case just under, in some cases just over. If just over, then it will be necessary to decide how to use the available fuel. ‘‘The F1 cars for 2014 may be categorised as a hybrid electric vehicle (HEV), which combines a conventional internal combustion engine with an electric propulsion system, rather than a full electric vehicle (EV). Like road-going HEVs, the battery in the F1 cars is relatively small sized. The relevant technical regulations mean that if the battery discharged the maximum permitted energy around the lap, the battery would go flat just after a couple of laps. In order to maintain “state of charge” (SOC) of the battery, electrical energy management will be just as important as fuel management. ‘‘The energy management system ostensibly decides when and how much fuel to take out of the tank and when and how much energy to take out or put back in to the battery. ‘‘The overall objective is to minimise the time going round a lap of the circuit for a given energy budget. This might sound nothing like road-relevant, but essentially, this is the same problem as the road cars: minimising fuel consumption for a given travel in a given time – the input and output are just the other way around. ‘‘The question then becomes where to deploy the energy in the lap. This season, KERS is used only a few places in a lap. But from 2014 all of the energy, from fuel and battery, is so precious that we will have to identify where deployment of the energy will be beneficial over the whole lap and saving will be least harmful for lap time – we call it “power scheduling”. This will be decided jointly between the chassis teams’ vehicle dynamics departments and Renault Sport F1 in Viry-Châtillon. ‘‘Choosing the best split between the fuel-injected engine and electric motor to get the power out of the Power Unit will come down to where operation of these components is most efficient. But again, SOC management presents a constraint to the usage of the electric propulsion. And the optimum solution will vary vastly from circuit to circuit, dependent on factors including percentage of wide open throttle, cornering speeds and aerodynamic configuration of the car. ‘‘There are quite a few components which will be directly or indirectly controlled by the energy management system; namely the internal combustion engine, the turbo, the ERS-K, ERS-H, battery and then the braking system. Each has their own requirement at any given time, for example the operating temperature limit. There can also be many different energy paths between those components. As a result, the control algorithm can be quite complex to develop and manage. The world of Formula 1 greeted Renault’s debut in Grand Prix racing with considerable scepticism. Back in 1977, the turbo engine was given a tough time when it was first introduced. Smoke was sometimes seen bellowing out the cars, as engines blew up. These reliability issues led to some nicknaming the first Renault “the Yellow Teapot”. But a couple of years later, those who had mocked the car were laughing on the other side of their faces as the RS10 won the 1979 French Grand Prix. Renault started winning consistently and their lead in turbo engines was soon followed by other manufacturers. From 1983 onwards, it was impossible to win a Formula 1 race without a turbo-powered car. 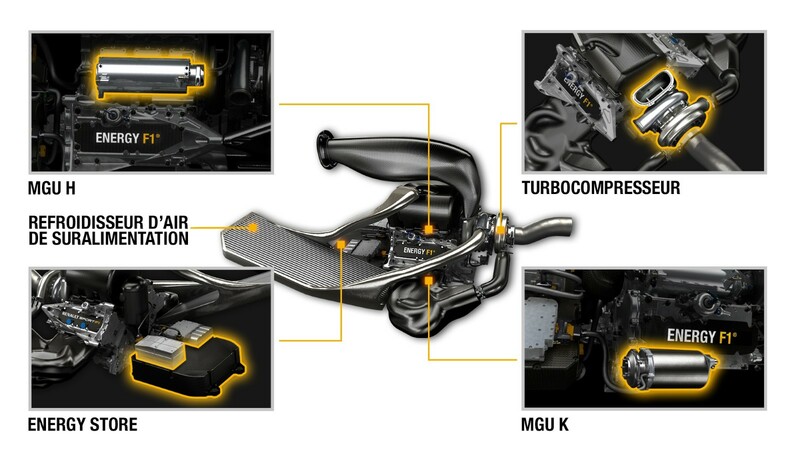 As the first turbo showed, one of the specific features of Renault’s involvement in Formula 1 is that it has always been a leading player in technological innovation. The introduction of the turbo engine led to a genuine revolution that totally changed the face of Formula 1, and also saw the introduction of new technologies such as the pneumatic valve springs that enabled unprecedented engine speeds to be reached. Subsequently, Renault has managed to adapt perfectly to the changing technical regulations. Once the turbo era was over, following two years away from track racing, Renault returned as engine partner with a brand new architecture – a V10 – which remains one of F1’s most famous and successful engines in the sport. Using this unit, the Williams and Benetton teams dominated F1 between 1992 and 1997. 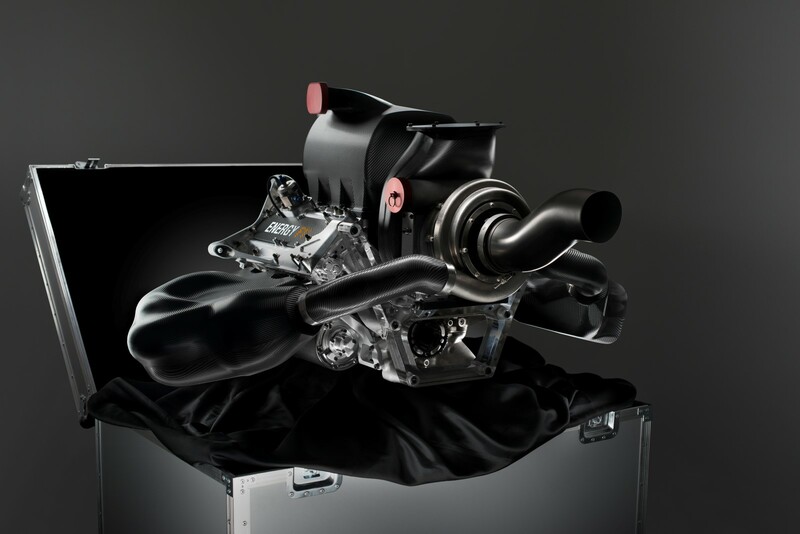 Renault engines have already claimed several records. No other engine partner has won so many Grand Prix in a single season. Similarly, no engine partner has claimed so many consecutive pole positions or secured as many front row lock-outs. Last season alone, Renault engines set a new record by scoring a total of 839 points over the course of the year. An achievement never seen before in the history of F1. Number of consecutive pole positions: 24 (between the 1992 French GP and the 1993 Japanese GP). Number of consecutive front row positions: 39 (between the 1995 Italian GP and the 1997 European GP). The privileged ties that have been forged between Renault’s facilities in Viry-Châtillon, where its F1 powerplants are designed and developed, and Rueil Malmaison, the company’s nerve-centre in the realm of series production engines, foster valuable dialogue and a high number of synergies. Renault’s production engines enable its customers to benefit from a level of powertrain excellence that has been honed in the exacting world of motorsport. The new Power Unit will be known as the Energy F1-2014 2014, a name which refers to the brand’s latest-generation production engines. On the race track and on the road alike, the Energy moniker covers three fundamental qualities, namely reliability, performance and low fuel consumption. Downsizing and turbocharging. Renault stood out as the pioneer in this field when it started to race in F1 back in 1977. Today, all the powerplants which form the brand’s Energy range are turbocharged with a view to reconciling the performance and fuel efficiency of its current smaller and lighter engines. Similarly, the Energy F1-2014 is a V6 turbo. Direct fuel injection alsostems from the two-way dialogue between Viry and Rueil in their respective bids to optimise energy efficiency, a parameter with which both activities centres are permanently obsessed as they seek to minimise fuel consumption. The latter has been cut by 40 per cent in the case of the Energy F1-2014 and is down 25 per cent in the case of Renault’s Energy production engines. UFLEX oil control ring technology, which has been used in F1 for more than a decade. The form of the ‘U’ permits the piston ring to adapt to the exact profile of the cylinder wall to obtain the best compromise between efficiency (oil scraped off the lining to minimise consumption) and friction. Renault Sport F1’s experience of high-performance engines proved beneficial when it came to designing the cooling system for Renault’s road-going turbocharged engines. An example is the transverse water flow system employed by Energy engines. Validation processes based on a thorough understanding of engine physics are also one of Renault’s key assets. Ensuring reliability at each race is vital to success in F1, while the durability of the brand’s Energy powerplant range is recognised in quality surveys. Last but not least, talent sharing with a view to pooling advanced skills is a vital ingredient when it comes to promoting fruitful, two-way dialogue and fostering the spirit of innovation. Dialogue covers the new challenges that both worlds face. The talents and skills required to develop Renault’s range of electric motors have consequently been tapped to contribute to the challenges associated with the electrical aspects of the Renault Energy F1-2014. Renault’s first turbocharged F1 adventure lasted for 10 memorable seasons from 1977 to 1986, but its legacy has endured for much longer. It was the experience gained with the 1.5-litre V6 that helped to develop Renault Sport into the organisation that has won 10 drivers’ and 11 constructors’ World Championships since 1992, and which is currently preparing a very different turbocharged F1 powertrain for 2014. In 1976 Renault Sport was founded. By then the company had already taken the momentous decision to develop an F1 version of the V6, which it had raced in sportscars. There had long been provision in the rules to run a turbocharged 1.5-litre engine, but no one had ever taken advantage of the option, and attempted to compete with the established 8 and 12-cylinder 3-litre normally aspirated engines. Renault’s engineers believed that a turbo could not just compete but ultimately outperform the opposition. Renault’s management still had to be convinced that the turbo was definitely the way to go, and that the company was also capable of building the entire car, rather than joining forces with an existing team. The F1 engine was developed in parallel with the sportscar programme as Renault chased its target of victory at Le Mans. It was a huge challenge. The engine department had to create a V6 that could be packaged efficiently in a single-seater, while a separate team of engineers worked on the chassis. Jean-Pierre Jabouille gave the prototype F1 car is first run at the Michelin test track at Clermont-Ferrand on March 23 1976. It was just the start of a long journey as the team prepared to enter the sport. ‘We needed to have the right level of power to fight the atmospheric engines,’ says Dudot. ‘But on the turbo we had the lag of a couple of seconds, and we never knew what to expect on the different types of track. The main problem was assembling the engine and packaging in the small car. It was heavy as well, and the weight balance was not ideal – that was one of our greatest problems at the start. In July 1977 the new Renault team appeared in public for the first time when Jabouille took part in the British GP. He retired from the race, and also failed to finish on his three other starts that year, but all the time the team was learning. That education process continued through 1978. Reliability was always a challenge, but in October’s US GP Jabouille brought the car home fourth to score the first points for Renault and any turbocharged engine. ‘I have to say that we took some time to achieve the right level of reliability,’ says Dudot. ‘At first we needed to put the suppliers at the right level of service, for example the guys supplying the pistons, valves and so on. We needed to improve quality control. Progressively we achieved it, and over the years we were more reliable, and able to challenge a lot more. The quest for reliability went hand-in-hand with the pursuit of performance, and gradually Renault achieved both targets. A move to a twin-turbo set-up for the 1979 Monaco GP was one of the big breakthroughs. The team had finally begun to conquer the critical problem of turbo lag, and Jabouille duly scored the marque’s historical first win on home ground in Dijon, having started from pole. Meanwhile the engineers continued to experiment. ‘For Zeltweg we made some huge changes to the radiators,’ Dudot recalls. ‘Normally the compressor has to compress air, but we needed to cool it before it could go into the engine. At the time we only had an air intercooler, but it was difficult to manage the right level of temperature for this. So we changed it with water, and after that made it air and water so we had two stages of cooling. That made it a lot more effective. In the early eighties Renault became a consistent challenger, not just for race wins, but also for the World Championship. Meanwhile one-by-one other teams followed the turbo route, in effect acknowledging that Renault had got its sums right. In 1983 the company became a supplier for the first time, joining forces with Lotus. Having a second team with its own chassis helped to speed up the development process. ‘Every year we needed to have a new engine,’ says Dudot. ‘Everything was different – the turbo, intercooler, boost control, injection: everything was very different and to a certain extent, very unsophisticated. In 1985 there was another landmark when Ayrton Senna and Lotus gave Renault its first customer win. At the end of that year the Renault factory team ceased operation, but the company remained in the sport as a supplier to Lotus, Ligier and Tyrrell. Indeed in 1986 the entire field used turbo engines, and power figures were boosted to way beyond 1000bhp, a figure even the Renault engineers could not have foreseen just a few years earlier. However, a new challenge was on the horizon. The FIA had decided that turbos were simply now too powerful and thus had to go, and a new formula for 3.5-litre normally aspirated engines was drawn up. Turbos were to be gradually reined in and phased out over the 1987 and ’88 seasons, before being outlawed completely by 1989. The skills and knowledge that the Renault engineers developed in the turbo era were the foundation of the success Renault has achieved since the first normally aspirated engine appeared in a Williams in 1989. 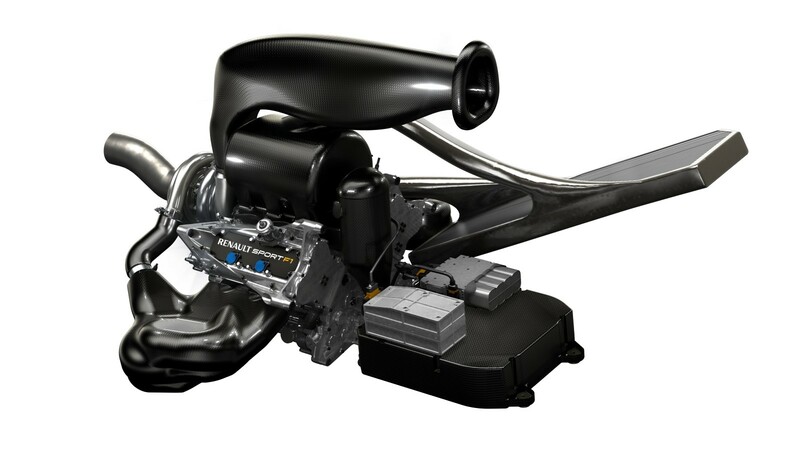 And now the company has gone full circle as the turbo returns to F1 in 2014, albeit in a more complex powertrain package. 1977: Jean-Pierre Jabouille gives the RS01 its race debut at the British GP, starting 21st before retiring. He also takes part in the Dutch, Italian and US GPs, qualifying as high as 10th in Zandvoort. 1978: Up to June Renault concentrates on preparations for Le Mans, where Didier Pironi and Jean-Pierre Jaussaud score a memorable victory. Target achieved, the focus now turns fully to F1. The team misses the first two Grands Prix of the year, but thereafter Jabouille runs a full season with the RS01. He qualifies an encouraging third in both Austria and Italy, and scores the marque’s first points with fourth place in the USA. 1979: The team runs a second car for the first time as Rene Arnoux joins Jabouille. The latter earns Renault’s first pole position in South Africa with the RS01, before the new RS10 ground effect car is introduced. In July Jabouille scores a historic first victory from pole on home ground in Dijon, and later takes further poles at Hockenheim and Monza. Meanwhile Arnoux earns two poles and finishes on the podium three times. 1980: The team is a consistent frontrunner throughout the season. Arnoux scores his first Grand Prix wins in Brazil and South Africa and also secures three pole positions, while Jabouille triumphs in Austria and earns two poles. Renault finishes fourth in the World Championship. 1981: Alain Prost replaces Jabouille and immediately makes an impression. He wins the French, Italian and Dutch GPs and takes two poles with the RE30, while Arnoux secures four poles, but fails to win a race. Renault moves up to third in the World Championship. 1982: Prost and Arnoux continue to spur each other on. Both men win twice with the RE30B, and they also take five pole positions apiece. Renault again secures third in the World Championship. 1983: Arnoux is replaced by Eddie Cheever. Prost has a great season and challenges for the title, winning four races and taking three poles with the RE40. However he just misses out at the final race in South Africa, while Renault also finishes second in the constructors’ table. Meanwhile Renault signs a deal for Lotus to become its first customer team, with Nigel Mansell and Elio de Angelis driving. The Briton earns the best result of the year for the new partnership when he secures third in the European GP at Brands Hatch, while de Angelis starts from pole in the same event. 1984: It’s all change at Renault as Patrick Tambay and Derek Warwick join the works team. Both men record podium finishes and score one fastest lap apiece with the RE50, while Tambay takes pole in France. However, there are no wins as Renault finishes fifth in the World Championship. De Angelis earns Lotus pole in Brazil, while Mansell repeats the feat at the new Dallas event. Meanwhile Ligier joins Lotus as a Renault partner. 1985: Renault has a difficult final year as a works team, although Tambay does at least make the podium twice. Meanwhile Ayrton Senna joins Lotus and scores sensational wins in Portugal and Belgium as well while taking seven pole positions. De Angelis adds another win for Lotus at Imola, and also takes a pole in Canada. Jacques Laffite logs a fastest lap for Ligier at Brands Hatch and finishes on the podium three times, while Tyrrell becomes Renault’s third partner team. 1986: With no works team competing Lotus flies the flag for Renault in fine style. Senna wins in Jerez and Detroit, but shows his real pace with eight pole positions. Laffite claims two podium finishes for Ligier, while Martin Brundle takes fourth for Tyrrell in Australia on what is the final appearance for the Renault turbo engine. Less than two years after the team’s debut at Silverstone Renault secured its maiden pole position at the 1979 South African GP. At Kyalami the high altitude favoured the turbocharged V6, which suffered less of a power loss than its normally aspirated rivals. Jean-Pierre Jabouille duly took the top spot, ahead of local hero Jody Scheckter. However he lost his performance advantage when the race started in tricky wet conditions, and after leading the first lap Jabouille ultimately retired from the race. Renault showed that the Kyalami pole was no fluke as the 1979 season unfolded and Jabouille and team mate Rene Arnoux regularly challenged for the top spots in qualifying. Initially results proved hard to come by as the team continued to hone reliability. However, on a glorious weekend on home ground in Dijon everything finally came together. After securing pole position Jabouille scored the first victory for the Renault team and for the pioneering turbo engine, while behind him Arnoux took third after a famous late battle with Gilles Villeneuve. Having won the European F3 title with Renault power in 1979 Alain Prost had a difficult first F1 season with McLaren the following year, although he showed his potential by scoring points with an uncompetitive car. He was an obvious choice to join Renault for 1981, and he instantly became a frontrunner and victory contender. After earning his first podium in Argentina he marked himself out as a future champion by winning his home race at Dijon, an event stopped on lap 58 after heavy rain, and later resumed for the remaining 22 laps. Team mate Arnoux backed him up in fourth. Prost finished fifth in the championship in his first year, and subsequently moved up to fourth in 1982 as he continued to log wins. Then as now to sustain a proper title challenge it was necessary to finish and score points as regularly as possible. In 1983 everything began to come together, and the title battle developed into a fight between the Frenchman and Brabham’s Nelson Piquet. Prost won in France, Belgium, Britain and Austria, and crucially logged a string of solid podium finishes. He went into the final race two points ahead of Piquet in the points, with Arnoux also still in mathematical contention. Unfortunately Prost retired from the race and Piquet took the title at the last hurdle, but it had been a brave effort. What did people in the paddocks think about you as pioneers of the turbo engine? People didn’t really believe in us. From a technical point of view, it was more of a challenge than anyone ever imagined. At the end of the 1970s and the start of the 1980s, the technology was in its infancy and we made changes at every GP. We were confident that we’d make it to the end of the race, but we were miles from actually winning. But that didn’t matter: we believed in what we were doing. We could see we were making progress and that, sooner or later, our efforts were going to pay dividends. People started looking at us differently when we won our first race, the French Grand Prix. It was both a radical change and a revelation: suddenly, the turbo-powered cars posed a real threat. It made others realise that they had to start thinking about abandoning normally-aspirated engines and switching to turbo. What were the characteristics and the challenges of the turbo engine, at that time? The most recurrent challenge we had was to do with lag. The drivers absolutely had to change their driving style. And, of course, the heat dissipation of the turbo engines was the most restrictive aspect in terms of designing a fast race car. The radiators had to be bigger, which made the turbo engines more difficult to fit into single-seaters than the normally-aspirated engines. Other than that, the other major issue was power. Generating an extra 500bhp of power output with a 1,500cc engine was a real achievement at the time. We were obliged to produce more power than the leading normally-aspirated engines of the time made by Cosworth, in order to compensate for the shortcomings of the turbo engines, and so reliability was the most testing aspect at the start. But you have to bear in mind that we went from 520/530bhp in 1979 to over 1,000bhp in the space of five years! At the end of 1986, we even had a test engine that was capable of developing up to 1,200bhp thanks to the use of new turbochargers, with a new design. At the outset, they were intended to be used at altitude and in the end, at sea level, they produced exceptional performances. Unfortunately, the engine only lasted three laps! What memories do you have of that era? I have some excellent memories. The technical development was fabulous. There was a lot more tuning work. From a purely professional perspective, it was fascinating. As a test or race engineer, you really enjoyed working on this project. Developing a turbo engine involves spending a lot of time on the track: the proportion of development time on a track is much higher than with a normally-aspirated engine. For a normally-aspirated engine, the lines and pipes have to be neat, the flow of liquids must be optimum, etc. With a turbo engine, it just has to work! It was a question of trial and error. I remember there was one time when we were at altitude in Kyalami. There is less air, so the engine wouldn’t start. We just couldn’t find the right settings to fire the engine. We had to heat it for two or three hours before we managed to get it to start. We came across difficulties with things that were as basic as starting the engine! Having said all this, I still feel a sense of failure as we never won the world championship. The turbo experience nonetheless enabled us to start again afterwards, with better foundations for what followed and, ultimately, to succeed. I have some very good memories of that period, and the fact that we had developed this new technology in a world like F1. How would you compare the engine from the 1980s and the 2014 engine? What was the first turbo era like for the drivers? If you go back to the start of the 1980s, it was all about response time: there was a lag of two to three seconds. We saw turbo engines develop every year, there were improvements between the first turbo engines in 1977 and those at the end, but throughout the period, the driving style was very different. You had to find the right moment to accelerate – and anticipate when the power would come through. Getting the timing right depended on a lot of factors: the type of corner, speed, grip, the type of tyres, how worn they were and how much the turbo had been used. For the drivers, there were corners where you definitely had to brake a bit earlier, so you could accelerate earlier, and therefore be able to have the required power at the right moment. That’s why there could be such big gaps between the cars, as well as drivers becoming tired towards the end of the race. Your brain had to process things differently. Will the use of turbocharged engines be different next year? When you look at the extent to which cars in general, and especially F1 cars, have developed from a technological point of view, there is no doubt that the turbocharged engines of the future will be very different. This is especially true because part of the power is generated electrically. We don’t have precise information about the response times as yet, but it will be very short compared with what we experienced in the 1980s. Will the drivers have to adapt their approach next year? Probably, yes. First of all, there will be a tiny lag, in terms of response time. I imagine it’ll probably be very small next year, but the drivers will nonetheless have to get used to it. But it’s not just a question of the turbocharger: the interaction between the combustion engine and the electric motors will also be very complex. The combustion engine generates around 600bhp and the electric motors around 160bhp, so power management will be much more of an issue than with the normally-aspirated engines used currently. The engines, and all the resulting energy use strategies, will be utilised by the engineers and the drivers in a variety of ways. In fact, it’s a return to an era when the driver will need to be strategic and very calculating in how he uses his racing car. Being quick will no longer be enough on its own; you’ll need to be quick and sensitive. 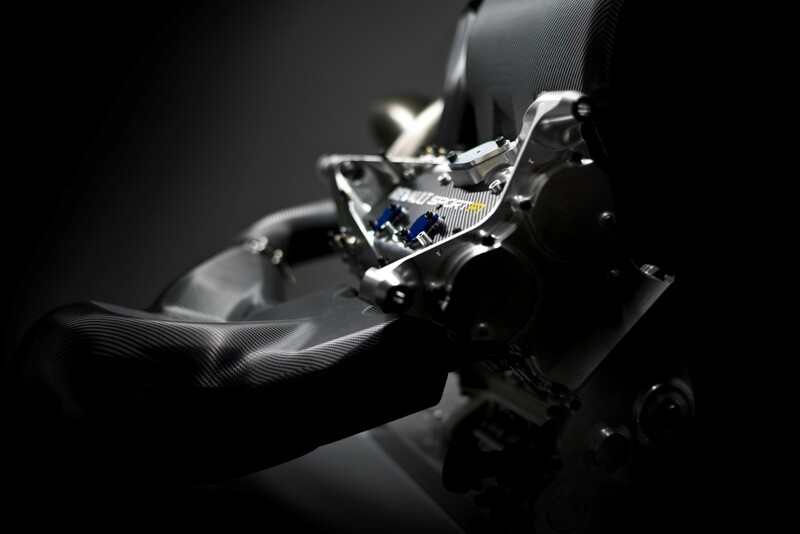 Will engines become more significant again in 2014? As soon as you freeze engine development, the chassis and aerodynamics become more important again. In 2014, the situation will be rebalanced. There’ll be a very interesting technical side to the sport, where greater emphasis will be again placed on engines. Whoever manages to get the various parts to gel most effectively will benefit the most and innovation will stem from good working relationships between the chassis and engine departments. And then the engines, and all the resulting energy use strategies, will be utilised by the engineers and the drivers in a variety of ways. In short, there will be new strategies that will increase the importance of the engines. On paper, it sounds perfect! Are we about to see the start of a new era in F1? Yes, I think so. Many people watching F1 are disappointed with the racing and the fact there are restrictions this year, even if they are subjective, and the engines are all more or less the same. In the 1980s, you have to say that the turbo engine years generated interest in F1: everyone was interested in this new technical challenge. It was also a bit of an emotional journey, insofar as huge developments were expected at each race. Many people are worried about the noise of the new turbo engines… what about you? I know that it’s an argument against them for some people, but I don’t think it makes sense. You need noise, of course, but there’ll be plenty of it. It’s true that we have had V8s, V10s and V12 engines which have made a terrific racket; you could even tell the engine just from the noise it made, without having to turn around. Personally speaking, I really like the noise of the turbo engines – they’re a not diesel engine, that’s for sure! There will always be people who say that it was better before, but the noise levels should be perfectly acceptable! Renault is not present at the Le Bourget air show by accident. Aeronautics is part of Renault’s history. From 1907, Renault designed and built aircraft engines in its plant in Billancourt for almost 40 years. And, most of all, there are numerous correlations between aeronautics and the world of Formula 1 motor racing. The engineers at Renault Sport F1 look to the aeronautics industry for inspiration and a source of advanced know-how. Finally, Renault’s entire engineering department benefits from this knowledge so that the Brand’s customers can find some of this technical excellence in their new car when it rolls off the assembly line. the grease and lubricants used in F1 have some properties in common with the products used in jumbo jets. A full 60% of Renault Sport F1’s suppliers also work for the aeronautics industry. 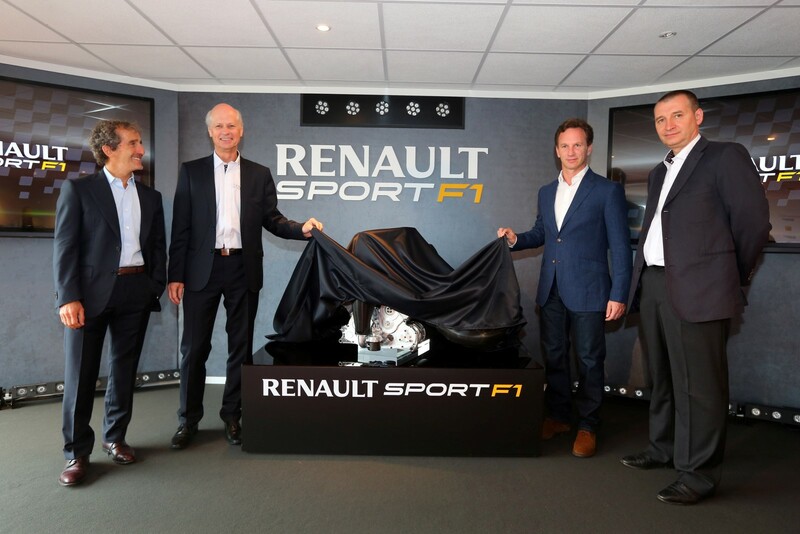 Mecachrome, a leading player on the aeronautics market, is Renault Sport F1’s main supplier. 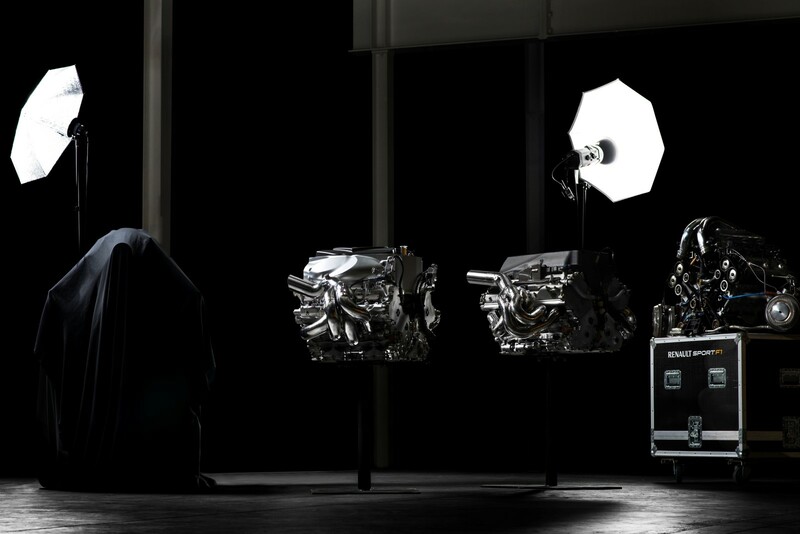 Mecachrome has been machining certain key parts and assembling Renault’s F1 engines for more than 30 years. The challenges facing the two sectors are similar, right from the design phase: reducing weight, fine-tuning the aerodynamics and ground effects and controlling vibratory phenomena are all crucially important considerations. It comes as no surprise that most of the designers working in F1 today were trained in aviation schools, including Adrian Newey, the chief technical officer at Red Bull Racing. The aeronautics industry and F1 both manufacture single parts one by one, as opposed to mass production, and use sophisticated production techniques, such as billet machining or lost wax casting for finer parts. Between 1907 and 1945, Renault manufactured thousands of aircraft engines in its factory in Billancourt. Louis Renault decided to start building aircraft engines because, at the time, Paris, and in particular the area around Boulogne-Billancourt, was the cradle of the worldwide aviation industry, but also because he was naturally interested in all mechanical innovations. In 1907, Renault released a 50 hp lightweight V8 engine that was snapped up by several aircraft manufacturers. They included the Farman brothers, who used the V8 powerplant to win the famous Michelin Cup, in which the competitors tried to cover the longest possible distance on a closed circuit. In 1910, Maurice Tabuteau won the trophy by flying 582 kilometers in 7 hours and 48 minutes at the helm of a Farman-Renault. In September 1914, Farman-Renault aircraft were called on to observe the movements of German troops on the ground, helping to win a crucial victory in the Battle of the Marne, along with the famous taxis, many of which were also made by Renault. In 1917, Renault released the 12 FE, a 300 hp V12 engine, which also enjoyed a long and illustrious career. Several thousand 12 FE engines were made, in particular to equip the Breguet XIV military reconnaissance aircraft. Once the armistice had been signed, the surplus military engines were put to other uses, including by the Aéropostale, which carried mail from Toulouse to Dakar, Senegal. In the 1930s, Renault benefited from the growth in tourist aviation and flying clubs. The company started making inverted engines and produced the Bengali, of which the 6-cylinder version was installed in the Caudron Simoun and the Caudron Goéland, both used by the French air mail service (the Air Bleu airline), which operated some 10 lines out of Paris. With the take-over of Caudron in 1933, Renault cornered the perfect market for its own aircraft engines. Caudron-Renault produced a number of particularly aerodynamic planes for air races, including the Beaumont, Gordon-Bennett, Deutsch de la Meurthe and Michelin (endurance) trophies. These high-speed aircraft scored many famous victories in these prestigious competitions. In 1933, a 170 hp version of the Bengali engine, installed in a Caudron C-362 flown by Delmotte, set a new international speed record of 333 kph for light aircraft over a distance of 100 km. On August 10, Hélène Boucher, set a new international speed record on aerodromes of 428 kph, which she then beat on the very next day, with a speed of 445 kph. On Christmas Day, Delmotte broke the 500 kph barrier onboard a Caudron C-460 with a 330 hp Renault engine, becoming the fastest terrestrial aircraft in France. But the Second World War put an end to all these projects. The aeronautics department was nationalised as part of two other companies: the engines went to Snecma, while the aircraft were taken over by SNCAN. Snecma continued to manufacture the engines developed by Renault. In 1997, Renault Sport founded the subsidiary SMA (Société de Motorisations Aéronautiques) with Socata and took up a new challenge on the back of its expert know-how in the world of F1: to build a low-cost engine for light aircraft. After one year of research, Renault Sport came up with a 200 kg turbocharged diesel engine, the Morane Renault. This genuinely innovative powerplant ran on Jet A1 kerosene, which is closer to diesel than to gasoline and much cheaper than the AVGAS fuel generally used in light aircraft. But diesel engines are heavy and large. It took all the talent of the engineers at Renault Sport to devise a lightweight and compact engine that can easily be fitted under the hood of a light aircraft. Rather than calling on new technologies, they opted to make clever use of existing solutions, such as lightweight aluminum alloy, they did away with 50% of the parts and used the lubricating oil as a coolant. The 230 hp Morane Renault engine was certified by the Federal Aviation Administration on July 8, 2002.